The Second World War has a central place in Russia’s national consciousness. Now, the country is gearing up for a blockbuster celebration of the 70th anniversary amid new tensions with its former allies. When invading Nazi forces reached the outskirts of Moscow in late 1941, the stakes couldn’t have been higher for the Soviet Union. Hitler considered Slavs an inferior ethnic race. Nazi records suggest that if Germany had been successful, tens of millions of Russians would have faced a genocidal regime of enslavement and forced exile. The statistics around the Battle of Moscow defy belief. Estimates of Soviet casualties alone range as high as 1.2 million people for that single battle — almost double the number that the United States lost in all of World War I, World War II, the Vietnam War and the Korean War combined. Nearly every family in Russia has a direct connection to the war. Hitler’s armies roll through Europe in the “blitzkrieg” phase of the war. Nazi Germany launches Operation Barbarossa, the invasion of the Soviet Union. Siege of Leningrad begins on Sept. 8. Battle of Stalingrad ends Feb. 22, 1943. The tide of the war begins to turn. During the Tehran conference from Nov. 28-Dec. 1, 1943, Joseph Stalin, Franklin D. Roosevelt and Winston Churchill agree to open a second front. Second front is opened with the invasion of Normandy on D-Day. On, April 25, 1945, the meeting on the Elbe takes place; Soviet troops arrive in Berlin May 2, 1945. The war in the Pacific continues until Japan surrenders on Sept. 2, after atomic bombs are dropped on Hiroshima and Nagasaki. Comparisons like these help demonstrate why the Second World War still looms so large in the minds of Russians — in a way that Western visitors to Russia often find surprising. Every May 9, Russia commemorates victory over the Nazi Germany with a zeal that is almost surely unequaled anywhere else in the world. Government offices and financial markets close; Moscow’s main thoroughfare becomes a pedestrian promenade bedecked with flags and black-and-orange St. George’s ribbons, the Russian symbol of military valor. The holiday is celebrated not just in Moscow. 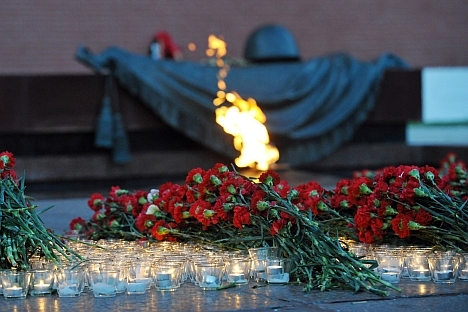 Practically every city in Russia has a monument to the war and an eternal flame where ceremonies are held. During the Soviet era, 13 cities that suffered particularly intense fighting were given the title of “hero city,” (города-герои), although only half of these are in modern Russia. Indeed, the Soviet Union endured the highest casualties of any country in the war, with estimates ranging from around 20 million to 28 million. The colossal human sacrifice made by the Soviet Union has led many average Russians today to feel as if their country paid the lion’s share of the cost for defeating Nazi Germany. The original victory parade was held in June 1945, after many Soviet troops had returned from the front. After that, parades were held on May 9, 1965, for the 20th anniversary, and then in 1975 and 1985. Since the May 9, 1995 parade celebrating the 50th anniversary of the victory, parades have been held every year. The Soviet Union and now the Russian Federation marks Victory Day on May 9 because although Germany surrendered on May 8, due to the time change, the surrender was signed after midnight in Moscow. Today it is both a chance to honor Russia’s past sacrifices and achievements and to show off the country’s latest military hardware. For the past 20 years, Russia’s leadership has pulled out all the stops every year and typically hosts dozens of heads of state in marking the occasion. This year, however, the celebration comes at a time when Russia is at bitter odds with the West over the armed conflict in Ukraine, and as economic sanctions threaten to force average Russians into making sacrifices due to the standoff. During a recent meeting of the committee organizing the 70th anniversary celebration, Russian President Vladimir Putin lashed out at unnamed critics he accused of attempting to downplay Russia’s role in the war — which is known as the Great Patriotic War in Russia. In late March, Russian Foreign Minister Sergei Lavrov said leaders of 26 countries plan to attend the Victory Day celebrations in Moscow in 2015, including Chinese President Xi Jinping. None of the leaders of major Western countries, including the leaders of the former allied powers U.S. President Barack Obama, British Prime Minister David Cameron and French President Francois Hollande plan to attend. German Chancellor Angela Merkel will also not attend the parade, although she will join Putin in laying a wreath at the Tomb of the Unknown Soldier beneath the the Kremlin Wall on May 10. In contrast, NATO troops joined Russian soldiers in marching across Red Square in 2010, while former U.S. President George W. Bush traveled to Moscow in 2005 to sit next to Putin for the 60th anniversary of Victory Day.